Bats are vital for the ecosystem and provide a natural way to control insects without pesticide. However, bats and humans should not cohabitate in the same home because bats can present a health risk and damage your home. There are environmentally sound solutions that can benefit both humans and bats. Critter Catchers specializes in humane bat removal in Michigan. They are the only company that is recommended by the Organization for Bat Conservation that is based behind the Cranbrook Institute of Science. After performing a bat exclusion, we recommend that homeowners install a bat house to provide an alternate roost for displaced bats. This way, you can enjoy the benefits of having bats in the area. 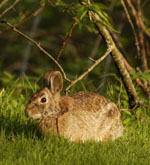 Cottontail rabbits are born March through October and are often found in the center of yards. The reason for this is to avoid predators and in wide open spaces, It is to the mother’s advantage as she can see all around her while feeding her babies. The mother rabbit goes to her nest only at feeding time, dusk and dawn, and she stays for just a few minutes. She is often mistaken as abandoning her babies and the babies are taken from their nest. 90% of baby bunnies will die if taken from the nest as most are not abandoned! If you are unsure that the mom is around, mark the nest with twigs laid in a tic-tac -toe pattern over the nest and if the twigs have been moved after 24 hours of waiting, mom has been there! If you need to mow your lawn when you know babies are nesting, put a laundry basket over the nest and remove when you are done. Keep cats away from the nest. Bell your cat or keep it inside for a few days to give the bunnies a good start. Cottontails are hairless when born but fully furred at one week of age. The eyes open in a few days and a week and a half later, the babies are on their own! Tiny babies in your yard are ok as they have left the nest and on their own. Do not touch them. Most Fawns are born early May through June. Doe’s will have a single, twins or occasionally triplets. The Doe leaves her babies deliberately to protect her infants. For the first two weeks, fawns have no scent and cannot be found by predators, unlike mom who does have a scent and could attract a predator to her baby. The fawns have a wonderful camouflage for their defense and will “freeze” if approached. The doe, while still close by, will come back a couple times a day to feed her fawns. She nurses quickly and it is unlikely you would ever see her. Kidnapping by humans is common and the doe watches while her baby is taken from her. It is important that the fawns are left alone. The doe will move it when ready. It the fawn is in harms way, it is ok for you to move it out of danger. Do not move more than 50 feet in any direction. The doe will find her baby. If the fawn is curled up like a cat, not crying or no signs of a dead mother, you can be sure that it is not in danger and the doe is around. Signs of trouble in a fawn are : non stop crying, indentations above its’ eyes, maggots, feces on rear, cuts or broken bones, a cold mouth or unusually friendly towards people. If none of these signs are present, leave it alone!! There are two species of Fox in Michigan, the red and the gray. The red prefers open meadow and the gray favors woods. As with most wildlife, the kits are born in early spring. The vixen (female fox) finds a hollow log or an empty woodchuck hole for her den. Coyotes are a feared predator for the fox and it is important for the fox to find a den where a coyote cannot access it. The male fox helps with the rearing of the young pups by bringing food to the den while the vixen keeps her young fed and warmed. Fox eat mainly rodents, moles and insects. They are beneficial to farmers as they eat so many pests. Fox do not eat dogs, cats or small children!! Fox are very curious creatures but do avoid humans and other animals. An infant fox will not leave the den unless it is accidentally disrupted at a construction site or a like situation. If you find an infant fox, it is probably without parents. Call a rehabilitator. The Opossum is North Americas only marsupial. It is an animal that is unique and widely misunderstood. Opossums are important to the environment by keeping areas clean. If you are a gardener, you will enjoy having an opossum in your yard as slugs are a favorite food. Possums often “play dead” or go into a catatonic state when confronted. They will show their 50 teeth but are not an aggressive animal although they will bite if pushed to do so. The opossum is a slow moving animal and has very poor eyesight and are killed on roads and by domestic dogs and cats for this reason. A mother possum carries her babies in her pouch and often found by passers-by when the pouch relaxes and they can easily crawl out. It is important to make sure that the mother is truly dead before taking her babies. It is safe to assume mom is truly dead if she is stiff and cold or with flies and maggots on her body. When you are saving baby possums, check the mothers’pouch by pulling it open like you would a shirt pocket and look around and under her body. The most common varieties of squirrels native to Michigan are the larger orange brown fox squirrel and the grey squirrel, which may also be seen with black fur. Both of these types of squirrels live in tree nests or dreys. They prefer nuts, seeds and some vegetation. They will have 3-4 babies per litter. The smaller red or pine squirrels are also common in many neighborhoods and have 6-8 babies per litter. The red squirrel may nest in a car, your walls or a dryer vent. Do not trap an adult squirrel unless you are positive they do not have babies left behind. 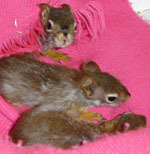 Baby squirrels may be placed back with mother up to 72 hours after falling from a nest. If a leaf nest has blown down after a storm or other event, itmay take 4-6 hours to rebuild it. Babies who seem lethargic and cold may recover some energy after being warmed to a normal body temperature of 103 degrees by providing warmth next to the baby (a bottle of water warmed and wrapped in a towel) Do not place babies unattended waiting for the mom to come for long periods of time. Place the babies in an open container with a towel to snuggle with and as close to the nest site as possible. Watch from a distance for mom to come. If an adult squirrel approaches but does not take the baby, it probably is not the mother. If you wait until dusk and if she has not returned, assume that she won’t and call a rehabber. 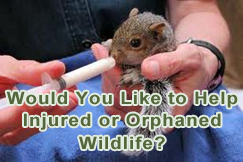 The sure signs that a baby needs help are: alone more than 2 hours, found after dusk, no fur, eyes closed, dehydrated, furred and eyes open but screeching or approaching people, bleeding or walking in circles, broken bones or uneven arm or leg movement or very little movement at all. Spring and early summer is nesting season for turtles. The females tend to lay eggs during a drop in barometric pressure which usually precedes rain or a thunderstorm. They may dig several false nests before finally deciding on the perfect spot. Nesting can take between 12 and 24 hours. 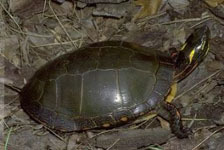 If you find a turtle on your property, assume she is nesting and keep away from the nesting site. She will find her way back to a water source after she is through laying her eggs. Turtles do not stay at the nesting site to incubate the eggs.The eggs will hatch in 90-120 days depending upon the temperature. Turtles often cross roads during breeding season. If you find a turtle on the road move it off the road in the direction it is heading. Never remove a turtle from the wild to make it a pet. It is illegal and will most likely not survive for long. Observe them in their natural habitat. They will survive and live a long life in the wild. Woodchucks or groundhogs, as they are commonly called, are the largest member of the squirrel family. They have one litter a year averaging four babies and are born March through May. The babies are almost always hypothermic if they leave the den in search of their mom, so finding a baby out of the den is a sure sign that something has happened to the mother and the baby is truly in need of rehabilitation. Woodchucks are one of our few true hibernators in the winter so they must adapt slowly to the changing climates in the springtime. Woodchucks are “edge eaters” and often get hit by cars while looking for and eating fresh new vegetation along the roadsides. They are diurnal animals (active during day) and are often blamed for undermining buildings. Actually, they dig straight down several feet and then tunnel to make a den. They are wise engineers and man does not give them enough credit for their strong designs.